Of Iowa's top 10 most populous incorporated areas, only one is a suburb (West Des Moines) and only one lost population between 2006 and 2007 (Waterloo). Of the top 50 most populous incorporated cities (total population 1,518,668 - half of the total state population), I would only classify 11 as "suburbs" based on their location in relation to other cities/towns and their and development history. Of those top 50, the population of the 39 most populous primary (non-suburban) cities in Iowa is 1,236,708 residents, or approximately 2/5 of the total state population. The total population of the 11 most populous suburbs is only 281,960 people. So in the top 50 cities, suburban population is about 18.6%. Of the total suburban population in the top 50 incorporated cities, just under half live in the three suburbs of West Des Moines, Ankeny, and (sub)Urbandale. This CLEARLY demonstrates to me that most Iowa residents do NOT currently prefer suburbs. HOWEVER.... Suburbs appear to be increasing in population at a significantly larger rate than cities. Of the 50 most populous cities, suburban ones experienced 30% population growth between 2000 and 2007. Central cities and disconnected towns experienced population growth of a meager 0.5% during that same period. Of the 50 most populous cities, suburban ones experienced 3.4% population growth between 2006 and 2007. 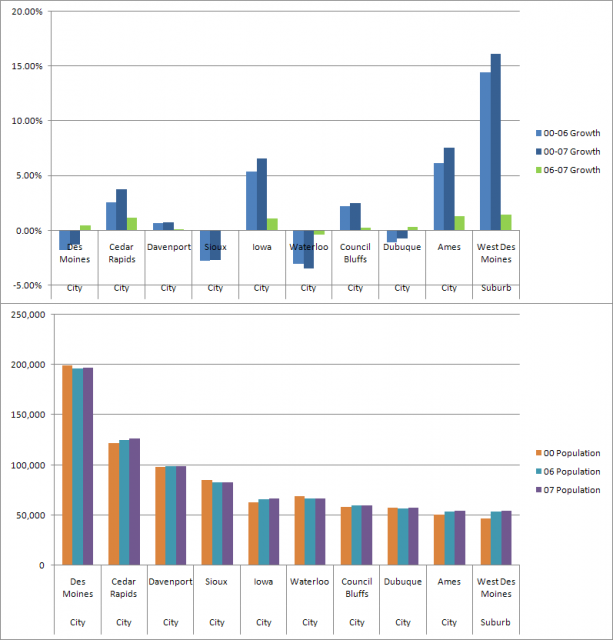 Central cities and disconnected towns experienced population growth of a meager 0.42% during that same period. The Des Moines Register incorrectly conflates percentage population growth with the overall raw number. Rate of population growth (or loss) appears much greater in suburbs and towns with lower population. A net migration of 2000 people is a much bigger percentage of a town with a population of only 30,000 people than it is in a city with 200,000. Low energy prices and subsidized infrastructure (roads, sewers, and water for example) have fueled a massive suburban migration. As suburban residents begin to feel pressure to reduce transportation costs, I hope they consider the benefits of living in central neighborhoods that are closer to and better connected to working, shopping, dining, and entertainment options. It looks like people may be slowly recognizing this. Over the seven year period between 2000 (the most recent full Census) and 2007 (the recently released estimates), The City of Des Moines' population fell from 199,608 people to 196,998 people, a 1.4% loss. However, this obscures a modest gain of 910 people in 2007 and a total gain of approximately 2,700 people since 2004, when the Register says Des Moines' population bottomed out. Actually it looks like most of the primary non-suburban cities that lost population overall between 2000 and 2007 show small gains between 2006 and 2007. I am much more concerned about the effect of energy prices on rural Iowa than suburban areas.